A variety of creative arts therapies, from visual arts to dance and music, offer critical pathways for service members to heal after traumatic brain injuries and post traumatic stress. 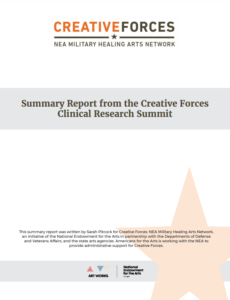 This report summarizes presentations from a two-day clinical research summit hosted by Americans for the Arts at the National Academies of Sciences, Engineering and Medicine and offers recommendations for advancing the field. next post: Can the Arts Save Us?